In discussing politics, we must remember that they are the establishing factors of governments and laws/policies around the world. I am not in favor of the churches being the government…we have seen the failures there, but a nation needs to establish its founding principles and use those principles to guide the way the government administers laws and policies. In my studies I have found no other founding principles other than Judeo/Christian for the United States. I can find no reference to Muslim, Hinduism, Buddhism, etc in the founding documents. Those founding principles lay the grounds for politics that can include politics that God could work with. 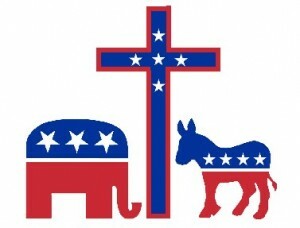 Unfortunately, as our nation has “progressed” we have moved further and further from those Judeo/Christian principles and more to the principles of “godless” politics. Probably no better example exist in today’s society as the way we have come to devalue human life, and we have done this cloaked in the guise of “rights”. A good place to start is in the way we have given nice sounding names to “infant murder”. – Since the 1960’s there have been more than one billion abortions worldwide. [Thomas W. Jacobson and William Robert Johnston,”Abortion Worldwide Report”, The Global Life Campaign, 2017]. That is roughly equivalent to one-seventh the total population of the planet. – The most recent and conservative studies show the annual worldwide number of abortions to be 12.4 million. The Guttmacher Institute, which was originally founded by Planned Parenthood and is now an independent research and policy organization committed to “Advancing sexual and reproductive health and rights in the United States and globally”, in a May 2016 report , estimated the number of global abortions to be an astounding 56.3 million per year. [Steven Ertelt,”New Report Claiming 56 Million Abortions Worldwide Every Year Wildly Inflated the Numbers”, LifeNews.com, May 26, 2016]. – In America alone, since the Roe v. Wade Supreme Court decision in 1973…this is politics in action…more than sixty million abortions have taken place. This is roughly equivalent to one-third of the entire generation conceived in the United States since abortion was “legalized”. – The abortion death toll in the United States is now approximately one million per year. [According to the Guttmacher Institute: Approximately 926, 200 abortions were performed in 2014, down 12% from 1.06 million in 2011…doesn’t that make you proud?]. – New York City has the highest abortion rate in the country. According to a recent Center for Disease Control and Prevention (CDC) Abortion Surveillance Report…as though pregnancy is a disease…New York City reported 69,840 abortions and 116,777 registered births, which means that the city’s abortion rate is 60% of its birth rate. [Tara C. Jatlaoui, et al.,”Abortion Surveillance – United States, 2013″, Morbidity and Mortality Weekly Report, Surveillance Summaries 65, no. 12(2016): 1-44]. – It is estimated that 92% of all women in the world who receive a prenatal diagnosis of Down’s syndrome abort their babies. [C. Mansfield, S. Hopfer, and T.M. Marteau,”Termination Rates After Prenatal Diagnosis of Down’s Syndrome, Spina Bifida, Anencephaly, and Turner and Klinefelter Syndromes: A Systematic Literature Review; European Concerted Action: DADA (Decision-Making After the Diagnosis of a Fatal Abnormality)”, Prenatal Diagnosis 19, no. 9 (1999): pgs. 808-812]. – In many countries, laws…politics…allow mothers to terminate their unborn children simply because they are the “wrong” gender, that is, not the gender they prefer. [Angelina E. Theodorou and Aleksandra Sandstrom,”How Abortion is Regulated Around the World”, Pew Research Center, October 6, 2015]. According to the Pew Research Center, 58 nations permit abortion on request; that is, for any reason at all. In such countries, a mother may terminate her unborn child on the basis of gender, and do so openly. If a family wants a boy and tests show that the child is a girl, an abortion may be performed, no questions asked. Scores more countries allow abortion ‘to preserve a woman’s mental health’ or for ‘economic or social reasons’. This is what ‘man’s politics’ permits. There are more ‘life preserving’ regulations concerning ‘puppy mills’. – In some countries, abortion is compulsory for couples who already have the state-allowed…politics…number of offspring. In China, for instance, that number had been one for many years, but was increased to two in late 2015. [“China New ‘Two-Child’ Policy Increases Births by 7.9%, Government Says”, CBS News, January 23, 2017]. Horror stories abound of women who had their babies forcibly aborted at seven, eight and even nine months of pregnancy, because they had violated this law…politics. [Mei Fong chronicled a harrowing account of this policy in China in the New York Post: Sterilization, Abortion, Fines: How China Brutally Enforced its 1-Child Policy”, New York Post, January 3, 2016]. These are just a few of the sad stories of how a godless society has justified the ‘murder of convenience’ of our most precious and innocent humans. One day “God’s politics” will carry out justice on those who have so mercilessly killed our children. But in our society, it gets even worse. Next week we will see how a godless society complete with ‘functional atheists’ involvement have set up to remove all human life that they consider as no longer contributing to the ‘good life’…i.e. a drain on our resources.